In this animated representation of the universe’s timeline, the first frame depicts the accepted model known as Lambda Cold Dark Matter, where the Greek Lambda stands for Einstein’s “cosmological constant.” The outline of the “bell-shaped” universe represents its expanding size. The transition time is the point in time at which the bell shape shifts from going inward to outward from left to right. The second frame shows the new University of Mississippi research suggesting that the universe has slowed down and speeded up, not just once, but seven times in the last 13.8 billion years. Image credit: NASA/WMAP Science Team. Many know the phrase “the Big Bang theory” from the top television comedy series with that title. 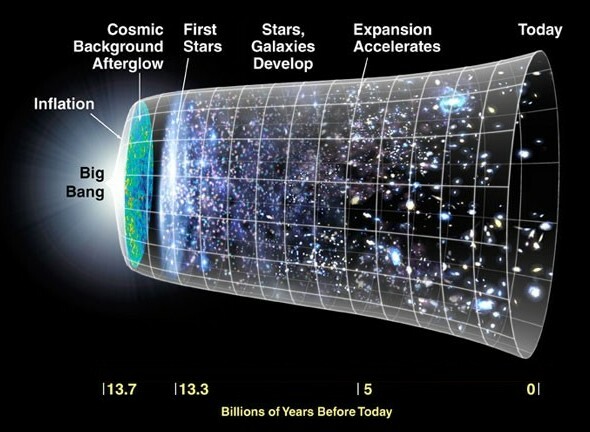 According to scientists, the universe began with the “Big Bang” and expanded to the size it is today. Yet, the gravity of all of this matter, stars, gas, galaxies, and mysterious dark matter, tries to pull the universe back together, slowing down the expansion. Figure 1. Image credit: NASA. 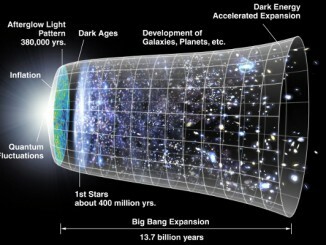 Figure 1 is a NASA diagram representing the events of the Big Bang from the beginning of time to the present day as described by the current, accepted model known as Lambda Cold Dark Matter, where the Greek Lambda stands for Einstein’s “cosmological constant.” This cosmological constant is responsible for the acceleration of the universe. 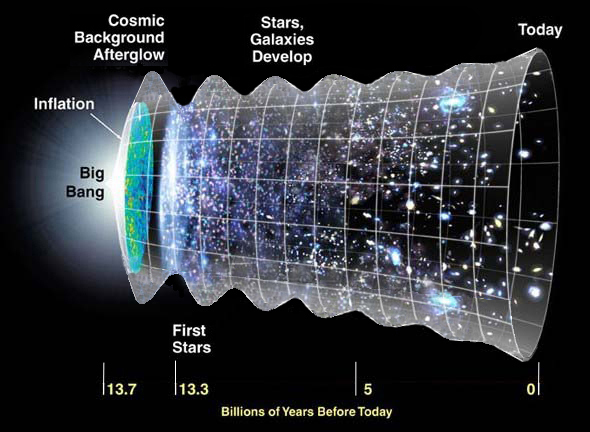 The outline of the “bell-shaped” universe represents its expanding size. The transition time is the point in time at which the bell shape shifts from going inward to outward from left to right. Figure 2. Image credit: NASA. Ringermacher says the discovery was made accidentally when, through their collaboration on dark matter modelling of galaxies, they found a new way of plotting a classic textbook graph describing the scale of the universe against its age (lookback time) that did not depend on one’s prior choice of models of the universe — as was traditional. 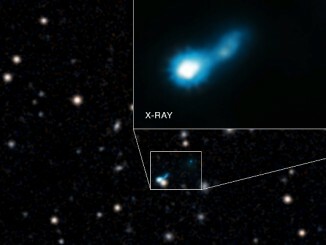 By combining X-ray data from NASA’s Chandra X-ray Observatory over a 15-year period with radio data from the Australia Telescope Compact Array, astronomers have a better understanding of the active galaxy Pictor A, the supermassive black hole at its core and the enormous jet of particles it generates travelling at nearly the speed of light into intergalactic space. 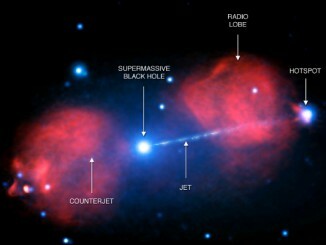 Dark energy explained by relativistic time dilation? Dark energy is proposed to drive the accelerated expansion of the universe, but a new study suggests that changing how we think about time dilation in relation to gravity as predicted by Albert Einstein can provide an alternate explanation.